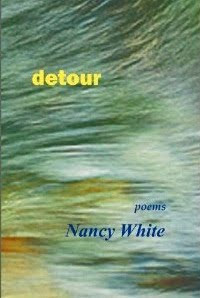 Today's featured poet is Nancy White, a very talented poet and a delightful person. I had the pleasure of meeting Nancy this past June at the Caffe Lena Poetry Festival. I loved her poetry and her presentation of it on the stage. After reading her latest book, Detour, I knew I had to have her here. Nancy White is the author of two books: Sun, Moon, Salt (winner of the Washington Prize, The Word Works) and Detour (Tamarack Editions). 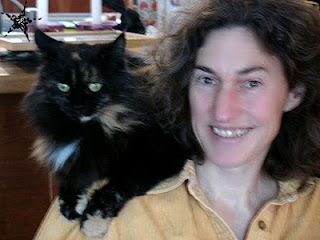 Further poems have appeared in The Antioch Review, Black Warrior Review, FIELD, Harpur Palate, Ploughshares, Rattle, Seneca Review, Virginia Quarterly Review, and others. She teaches at Adirondack Community College in upstate New York, is Associate Editor at The Sow’s Ear Poetry Review, and also now serves as editor and president for The Word Works in D.C.
Today's poem comes from Detour. DL: Why did you decide to omit punctuation and capitalization in this poem? NW: The issue of punctuation and capitalization was huge for me in this book, actually. If you look at the first poem, “Woven and Sewn,” it’s packed full of periods. Every line has at least one. In other poems the reader has to figure out all the phrasing for herself—where the pauses and grammatical groupings have to occur. One fellow poet, whose advice I respect, felt I should make all the poems in the manuscript adhere to that latter principle. Wrestling with that advice, that possibility, helped me realize and then refine what I was doing with my fluctuating use of periods and commas in the book. The character (who eventually, over the years of working on the book, ceased to be me) was finding news ways to perceive and shape reality—her life—but only after a sort of dissolving feeling, a falling apart. I’m pretty sure most people who have gone through a divorce (with or without children, with or without the legal contract) know what I’m talking about there. Your recovery is dependent upon being able to handle the resulting period of being “at sea,” and then an ability to start putting things back together, but in new ways, in new patterns. I like to think the coming-and-going of the punctuation and other “rules” in the book mirrors that process. I also found a tremendous lightness in working without those rules, in using white space and line breaks instead of caps or punctuation. A surprising new language evolved, for me, and, like the surprise of being single again, turned out to expand rather than ruin the world. It could be gimmicky, and as poets we have to beware that danger, but if used in a muscular way, as a technique that pushes the language to greater precision and force, I think it makes a superb exercise for any poet. Anyway, I hope I pulled it off! DL: The strictness of the 3-line stanzas seems at odds with the abandonment of punctuation and capitalization. Tell us why that disparity. I love the regular look of repeating stanza sizes, but I hate received rhythms, almost never work in received forms. Jazz is more my kind of music, I love spondees that throw the whole train of a poem off the tracks, there’s no better fun than shifting the rhythm of a line—and yet I hate set rhythm. Maybe it’s cheating, but I still like to build in the contradiction of a set stanza size, so the poem has a formal look to it even if there is no received form at work. 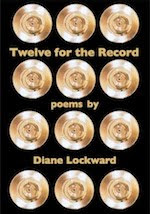 I used a lot of couplets and tercets (all unrhymed) in this book, two-line stanzas because the book is about the letting go of a two-person relationship, three-line stanzas to show a more stable form, where a third possibility keeps growing out of jarring pairs. I’m hoping I achieved some kind of useful paradox in appearing formal but being in fact pretty loose when it came to standard rules. I want to say this paradox reflects the institution of marriage itself. There’s a formal pact, about which we make an enormous deal with lots of ceremony and so on, but the proof is in the daily pudding, not the formal or legal arrangement. DL: Another structural device here is the catalog of both the beloved’s body parts and his personal attributes. The selection of items and the order in which they appear—random or calculated? NW: At first such things are fairly random, but as you revise, you start moving things around. I definitely wanted a mixture of the concrete and the abstract, the parts and the attributes. When you fall in love, you are responding to such an organic mix of parts: the body, the movements, the feelings projected, a million tiny cues about personality and attitude and history. The poem contains by no means an exhaustive list, but I did want it to give a sense of the smorgasbord of elements in a person that I was, long ago, responding to. DL: You speak of “his appearance golden,” but end with “his darkness is love.” Please explain the apparent contradiction. NW: Well, you know how first there’s the person of the poet writing out of experience and probably some primitive desire to express an emotion or a thought or “the self” or whatever it is… And then as poets we have to refine what happens, and ask ourselves brutally whether that spurt can ever really become a poem that’s worth anyone else reading. It could take a couple of years of revising for me to know; I’m pretty slow. Anyway, the “him” who got this poem started was indeed quite beautiful, and did have a golden quality. Handsome, smart, and people looked up to him too. The darkness came over time, and confronting and coping with that darkness is part of what this book is about. It’s the darkness of a person who couldn’t rise to the occasions of later life, and who breaks things in his effort to avoid growing up, or facing the music, or whatever it is that a midlife crisis demands of us. By the end of our relationship, or of the development of the poem, his love really was no more than darkness, had been snuffed out. The line used to read, “his darkness his love,” as if they were two separate and possibly battling things. But in the end I decided they had become one entity, and that it was a “love” I did not want to partake of. So that “h” disappeared from the poem, and I felt a kind of letting go as I deleted it too. DL: I was both amused and surprised by “his lack of hangnails.” Why do you praise the beloved for not having something so insignificant? Would it be a strike against him if he did have hangnails? NW: I admired his lack of hangnails at first, for the plain reason that I always had them—from worry, from habit. So I envied the smooth hands. As the poem developed, though, and I started adding and taking out details, I realized that his lack of worry was part of his “darkness.” How one person can remain serene, even if only on the polished surface, while recklessly disemboweling a family, a love, is really a cause for horror and not for admiration. So the non-hangnails took on quite a different meaning, but also became emblematic for me of how my own understanding of the situation changed over time. What had seemed beautiful was, under the surface, the opposite. Isn’t remorse our saving grace? So some hangnails would have been nice. Also, though, as a writer I just like to mix up the types of detail that I’m using, just to keep my own and the reader’s minds hopping. Predictability, too much pattern, isn’t what I’m looking for in poetry—my own or other people’s. 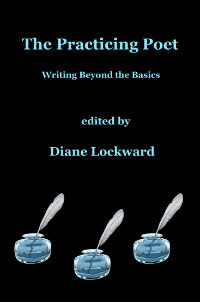 Readers, you can have the additional treat of reading "Woven and Sewn" at Verse Daily where it was featured on October 4, 2008. And please do not miss Nancy's self-interview at The Nervous Breakdown. Fascinating look at poetry-making. Thank you. Very engaging interview, and a nice feature for your blog. So glad that the Caffe Lena Poetry Festival helped to connect you and Nancy. Your exploration of no punctuation is quite timely, now that Mr. Merwin is our US Poet Laureate! Glad I met Nancy and glad I met you!